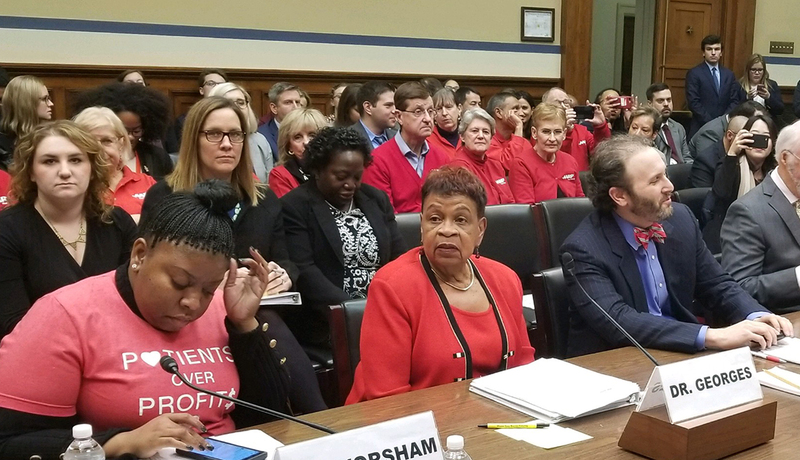 Catherine Alicia Georges (center), AARP's national volunteer president, testifies at a hearing. En español | Older voters across the country want Congress to rein in the cost of prescription drugs so they don’t have to choose between paying for their medicines or going bankrupt, Catherine Alicia Georges, AARP’s national volunteer president and a longtime nurse, told a House of Representatives investigative committee on Tuesday. “Current prescription price trends are simply not sustainable,’’ Georges told members of the House Oversight and Reform Committee, whose chairman, Rep. Elijah Cummings, D-Md., has launched an investigation into some of the nation’s highest-priced prescription drugs. Lawmakers from both chambers of Congress today began what is expected to be a series of hearings on how to curb the high prices of prescription drugs. At the Senate Finance Committee, Chairman Chuck Grassley, R-Iowa, said tackling high prescription drug costs will be one of the first priorities of his panel. At the Senate hearing, Grassley called for more transparency when it comes to drug prices. “You should not need a Ph.D. in economics,” he said, to be able to understand what prescription medicines cost. Sen. Ron Wyden, D-Ore., said one of his priorities was for Medicare to use its bargaining power to “get a better deal” for seniors on drug prices, a key AARP priority. House members also raised the issue of allowing Medicare to negotiate drug prices. “Why don’t we just let Medicare do for our senior citizens what the VA is doing for our veterans?” asked Rep. Stephen Lynch, D-Mass. Veterans pay a fixed $8 or $9 copay per prescription, Lynch said. Georges told the House panel that in AARP’s 2018 voter issues survey, 92 percent of voters age 50 and older said that the candidates’ views on lowering drug costs were important to them, with 74 percent saying this issue was very important. Pre-election and exit polls consistently put health care access and cost as the most important issue for voters. Georges also provided data to the committee illustrating the huge increases in prescription drug prices, particularly on brand name medicines. AARP Public Policy Institute’s most recent Rx Price Watch Report found that the retail prices of brand-name drugs widely used by older Americans increased by an average of 8.4 percent in 2017 — four times the rate of inflation. She also pointed out that the high cost of drugs “is passed along to everyone with health coverage through increased health care premiums, deductibles and other forms of cost sharing.” Georges also said that in 2015, seniors spent more than $27 billion out of pocket for their medicines.